The increased amount of poly adds weight and body to the center of the Xplosion. This blend places the emphasis of your swing on the tip and adds durability to the rope. 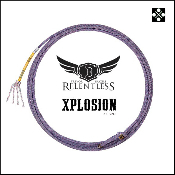 The Xplosion is part of Trevor Brazile’s Relentless line by Cactus Ropes. Nylon Poly Four-Strand, Length: 31’ Diameter: Small, Available Lays: Super Soft (SS), Extra Soft (XS), Soft (S).